Working from dusk until dawn, fishermen from around the town of Aral in Kazakhstan haul in a catch from the North Aral Sea, where the water level has risen and salinity has decreased—in stark contrast to the larger South Aral Sea, which has gone nearly dry. On shore, a night’s fishing might bring 100,000 tenge (US $533), an economic lifeline in a struggling region where fisher- men have been heroes before. 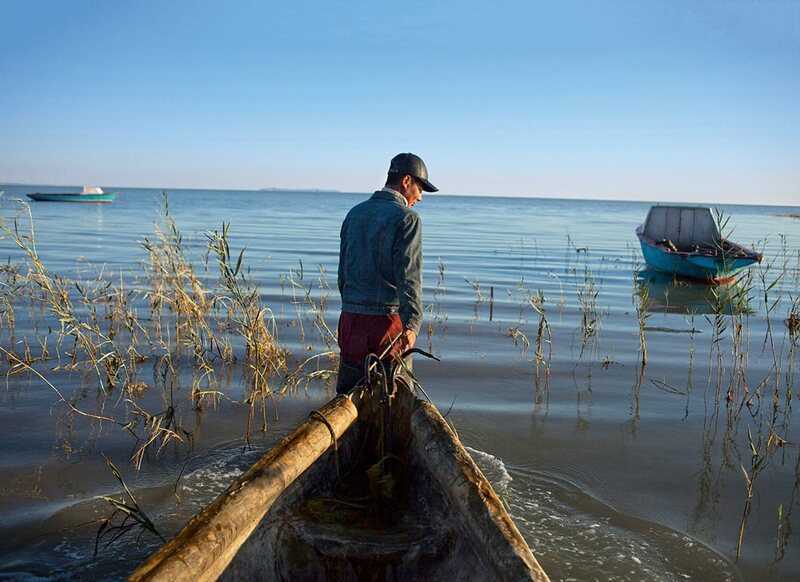 Into the slowly rising waters of the North Aral Sea, a fisherman wades out along a marshy shore that from the 1980s until a few years ago was a dusty desert’s edge. This smaller, now separate part of what was once the world’s fourth-largest inland sea has increased its water volume by half in a decade. 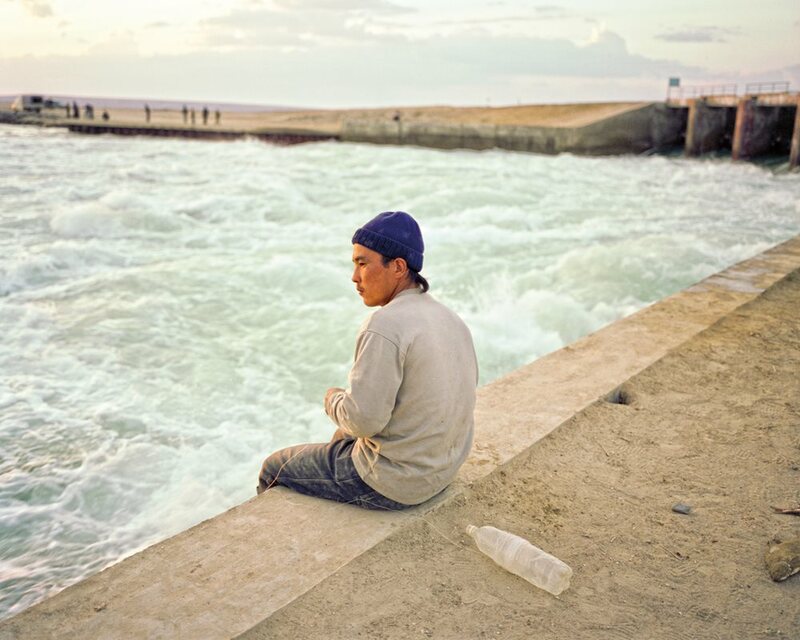 Working from dusk until dawn, fishermen from around the town of Aral in Kazakhstan haul in a catch from the North Aral Sea, where the water level has risen and salinity has decreased—in stark contrast to the larger South Aral Sea, which has gone nearly dry. On shore, a night’s fishing might bring 100,000 tenge (US $533), an economic lifeline in a struggling region where fishermen have been heroes before: They appear in Aral’s museum in a mural commemorating the valiant dispatch of 14 boxcars of fish a day after a desperate telegram arrived from Vladimir I. Lenin in 1921 requesting famine aid for Moscow. In the 1960s, the Soviet Union's hunger for cotton—sometimes called “white gold”—inspired the building of 30,000 kilometers of irrigation canals along both the Syr Darya and Amu Darya rivers that diverted replenishment of the Aral Sea, which began to evaporate. 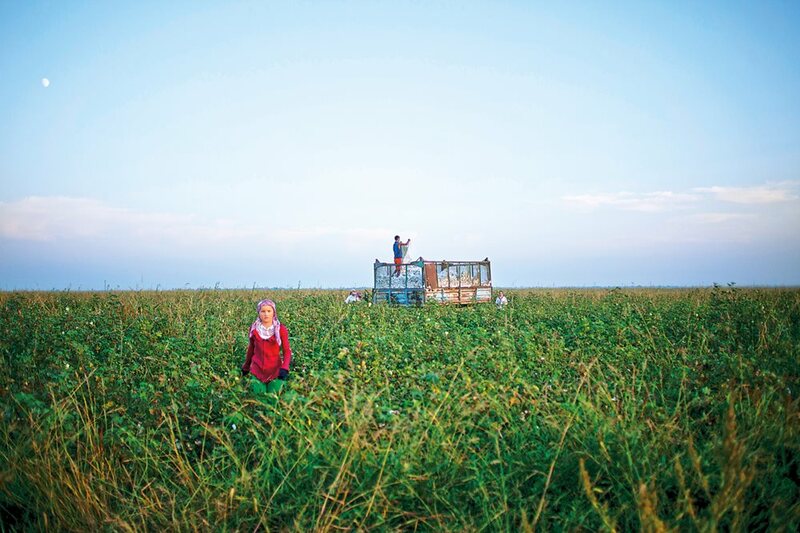 This cotton field in Kazakhstan is shared by three families. Flowing into the North Aral Sea from headwaters in mountains more than 2,000 kilometers to the southeast, the Syr Darya River, is lined here on both banks by irrigated crops. 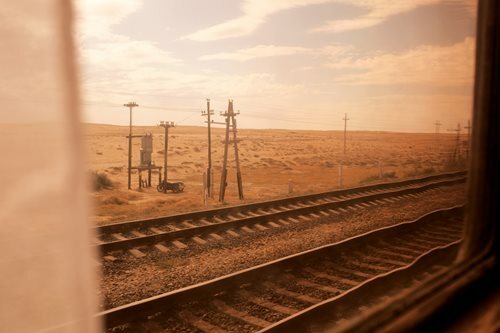 Arid steppe stretches for hours outside a dusty window along the rails from Kyzylorda to Aral. Stranded as waters retreated and abandoned by their owners, fishing fleets such as this one at Zhalanash, now only hint at the former shoreline. 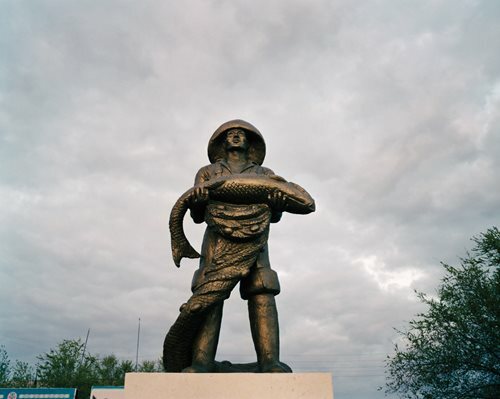 Once-abundant freshwater fish, commemorated by a statue in Aral, were reduced to a vestige of their former numbers by both the decrease of habitat and the rising salinity caused by the lack of replenishment from the Syr Darya and Amu Darya. 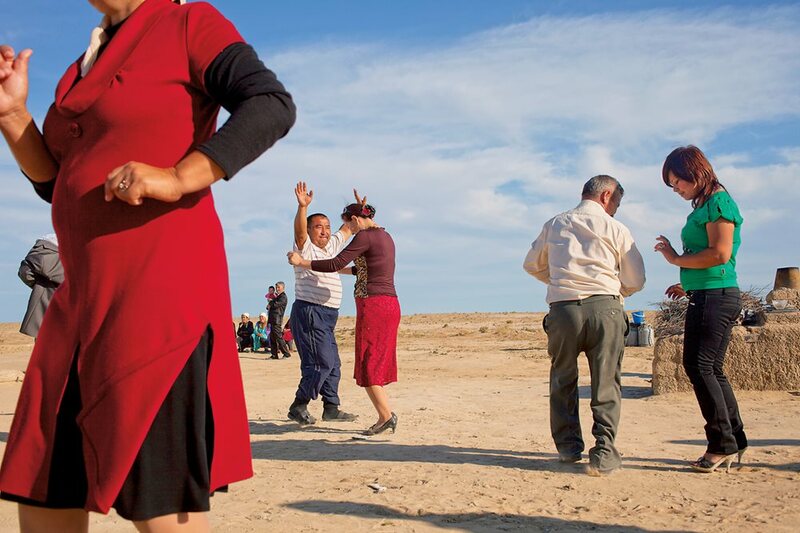 Along the shore of the North Aral Sea, a wedding gives an occasion for a dance in the village of Tastubek, where fish catches are rising with sea levels. 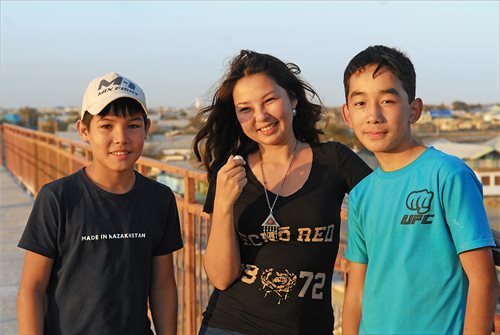 Kazakh translator Dinara Kassymova poses in Aral with two boys. In 2014, British rock band Pink Floyd hired local boys for “Louder than Words,” a music video that looked at Aral through the eyes of youth. As the largest of the towns along the North Aral Sea, Aral was also a light manufacturing hub based on sheep-grazing: A historical marker notes that in 1976 the city exported 5,000 metric tons of wool, 340 furs, 3,000 sheepskins, 1,500 pairs of woolen gloves and 1,200 pairs of woolen trousers. “We want to show our generation how life used to be here,” said Madi Zhasekenov, director of Aral’s museum. Both North and South Aral Seas have shallow coastlines. At Aral, retreating waters stranded the formerly seaside town 100 kilometers inland; however, in the past decade, the waters have been returning. They now lie about 20 kilometers from Aral—and they are coming closer. Kazakh and international water management initiatives have helped the North Aral Sea increase its volume by an estimated 50 percent over the past decade. This year fishermen are catching some 22 species here, and catch numbers are rising. Oltinay watches television while her son reads the paper at home in Aral. She remembers her late husband’s job at Aral’s fish-processing plant, which has recently started up again. “In 2000 there was huge unemployment, but things have gotten better,” said Adilbek Aymbetov, director of the plant. 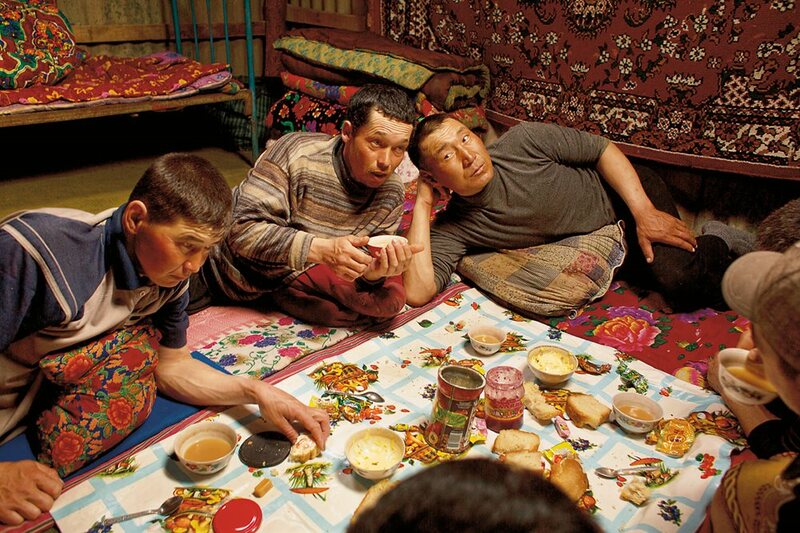 This allows young men such as these fishermen in Tastubek to stay for weeks at a time near the sea, fish at night and relax in between over shay (hot tea) and kleb (Russian for bread). 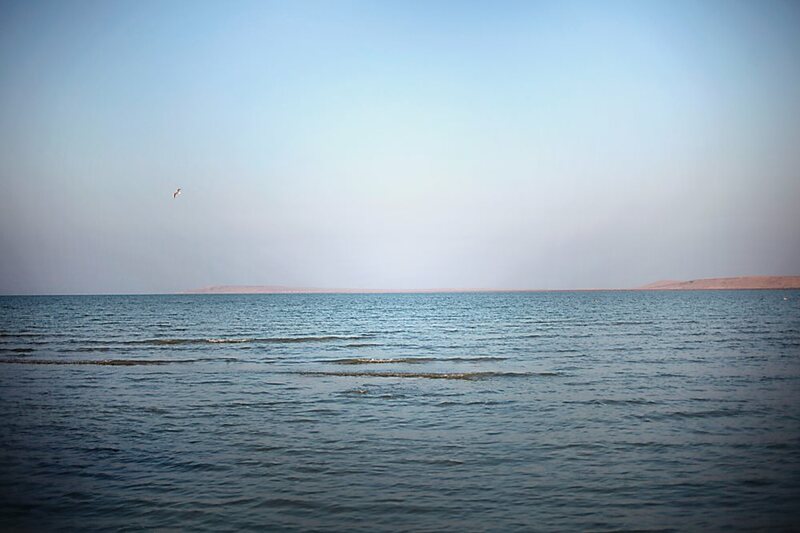 Spanning what may be the most strategic 13 kilometers of North Aral Sea coastline, the Kok-Aral Dam, finished in 2005, regulates the water released from the North Aral Sea and its tributary Syr Darya river—raising hopes as well as water levels. 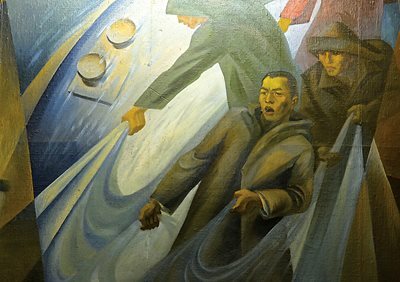 The municipal museum in the now-dusty former fishing port of Aral displays a surprising work of art: a mural that honors local fishermen who in 1921 helped save Russia from starvation by sending to Moscow 14 boxcars loaded with fish. Near it is a photocopy of Vladimir I. Lenin’s typewritten letter of thanks to those fishermen, and near that is a bronze bust of Aral’s own hero of that effort, Tölegen Medetbayev. Surprising, because those 14 boxcars of carp, sturgeon, bream and other freshwater fish came from the same part of the Aral Sea that from the 1980s until relatively recently had become too salty for anything to survive. Surprising also because, having heard for years much about the demise of the Aral Sea, it was heartening to learn that in the North Aral Sea—which is only some 10 percent of the inland seabed once a bit larger than Sri Lanka or the state of West Virginia—a reversal of decline is under way: The North Aral Sea is, slowly, coming back to life. The closest that commercial airlines fly to Aral is Kyzylorda, an eponymous provincial capital of about 190,000 people, about 90 minutes flight time south of Kazakhstan’s capital, Astana. Taking that flight late in the afternoon, my translator Dinara Kassymova and I arrived just in time to board an overnight train to Aral. We shared a compartment with a young woman who introduced herself as Aynura, on her way home with her two infant sons, Islam and Muhammad. The windows were too caked with dirt to see much. 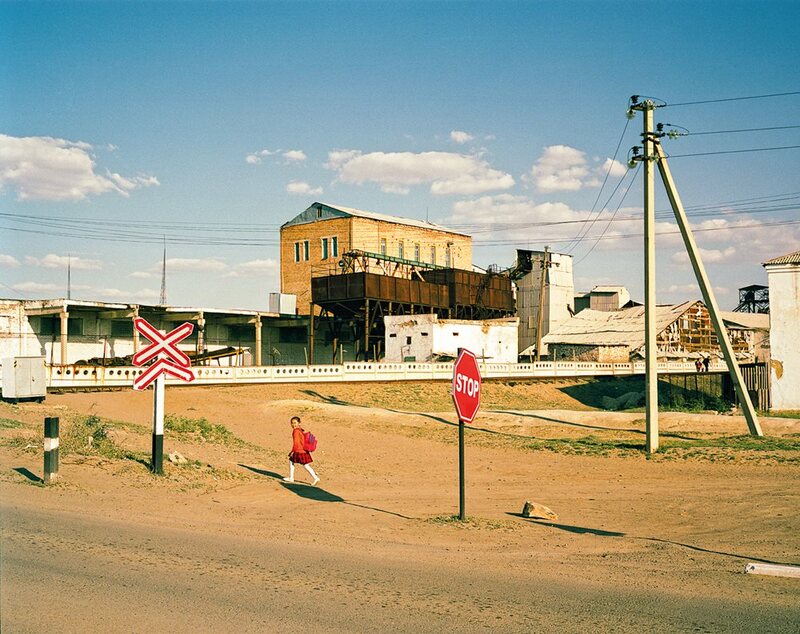 As the Soviet-built train chugged and belched northwest along the steppe, I realized that most of the passengers who weren’t sleeping had gathered outside our compartment—one of the last ones in the last car—to smoke unfiltered cigarettes while gazing at the night through an open door. In search of fresher air, I wandered the other way, past a cook nonchalantly frying onions in the dining car’s tiny kitchen and an elderly man sitting facing his wife, peeling potatoes for their evening meal. In the dining car, decorated with plastic red roses at each table, a waitress with gold teeth named Shireen served meat and vegetables. Before joining the railway, she said, she had taught journalism in her native Uzbekistan. Of all the passengers, the only ones who didn’t appear to be locals were a young television reporter and his cameraman assigned to cover a three a.m. rocket launch at the Baikonur cosmodrome, which lies between Kyzylorda and Aral. After eight hours, around daybreak, we pulled into Aral, now a gaunt little town that once thrived on fishing. A local representative met us at the station, and together we walked the few blocks to Aral’s modest city hall. Kristopher White, an associate professor of economics at kimep University in Almaty, Kazakhstan’s largest city, agreed. He’s an expert on the Aral Sea, called Aral Teñizi in Kazakh and Aralskoye Morye in Russian. “Certainly, this is an environmental disaster. We’re talking about [what was once] the world’s fourth-largest inland body of water,” said White. Since 1960, he explained, when the commercial fishing catch exceeded 43,000 tons, the Aral Sea has lost as much as 88 percent of its surface area and 92 percent of its volume. In 1996 only 547 tons of fish were caught, much of it contaminated with pesticides. Meanwhile, salinity had jumped from 10 parts per thousand (ppt) in 1960—essentially fresh water—to 92 ppt in 2004—some three times the salinity of most oceans. 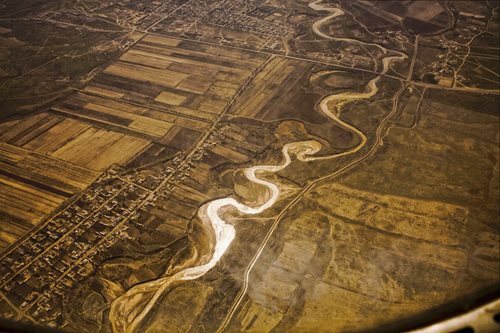 Left: Flowing into the North Aral Sea from headwaters in mountains more than 2,000 kilometers to the southeast, the Syr Darya River, is lined here on both banks by irrigated crops. Right: Arid steppe stretches for hours outside a dusty window along the rails from Kyzylorda to Aral. This, he said, destroyed fish habitats and, with the recession of the sea, “there was also what we call desiccation, or encroaching deserts. An entire desert landscape has replaced much of where the sea was.” This has been a humanitarian disaster, too, he added, in which the sea’s disappearance brought unemployment, poverty and emigration. 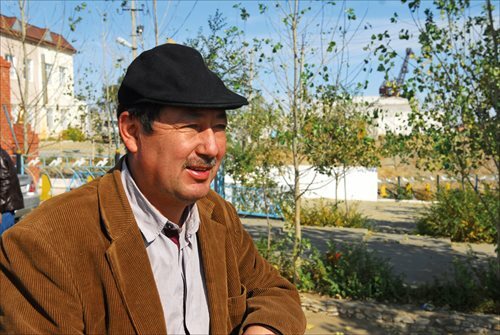 Darmenov, 58, didn’t hesitate to place blame squarely on the ussr, whose agricultural scientists and civil engineers transformed semi-arid steppe into fields of cotton and wheat through irrigation that required building some 30,000 kilometers of canals, 45 dams and more than 80 reservoirs. By 2000—nine years after the Soviet Union’s collapse—the once-mighty lake had separated into two unequal parts: the North Aral Sea in Kazakhstan, and the much larger South Aral Sea mostly in Uzbekistan. 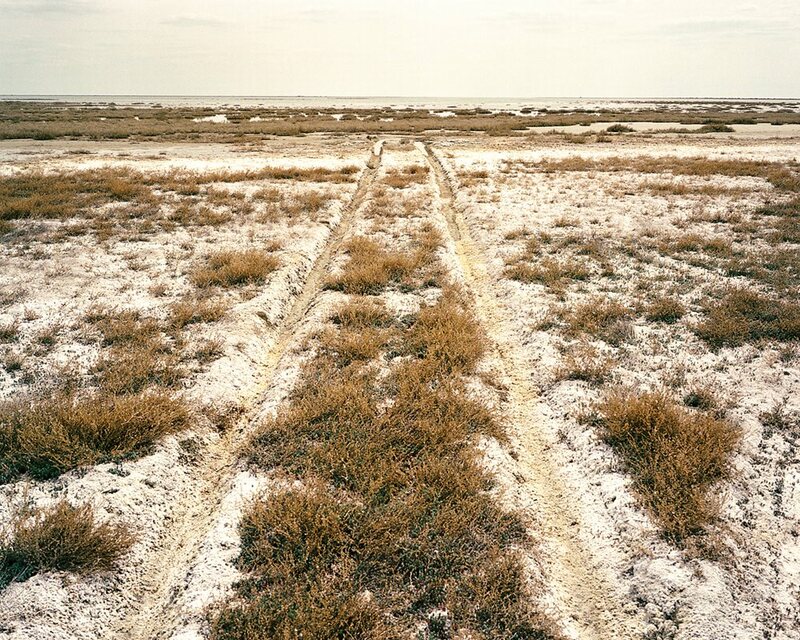 Today all that’s left of the South Aral Sea is a narrow, crescent-shaped sliver of water along the western shore, and experts predict it, too, will disappear because it has no link to the Amu Darya river that once fed it. Aral, population just above 30,000, is the largest town on the northeast shore of the North Aral Sea, and some 73,000 people remain living in the surrounding region. Here, explained Darmenov, the Kazakh government and World Bank must work together with the Syr Darya river to save the sea. The river is the sea’s sole source of replenishment, and its fate is still largely determined by cyclical rainfall patterns, as well as snowmelt from the distant Tien Shan Mountains. The sea’s decline is chronicled in stark detail at Aral’s municipal museum on Tokey Esetov Street, right off the main drag, Abulkhair Khan Street. Established in 1988, the museum collects an entry fee of 200 tenge (about $1.10) from each of the 15,000 people who visit annually. Here, stored in three glass display cases, are animal teeth, shells, glass shards and ceramic fragments—all found on the dry seabed after the lake began drying up in the 1970s. There’s also an 1849 map of an obviously much larger Aral Sea, credited to Commander A. Butakoff of the Imperial Russian Navy, as well as a painting made in 2003 that shows, a bit nostalgically, what Aral’s port looked like in the 1960s. Remote the museum may be, but its guestbook is full of comments from Dutch, French, Spanish and American visitors. Yet to the museum’s director, Madi Zhasekenov, the museum is not just for tourists. “We want to show our generation how life used to be here,” Zhasekenov said as he locked up his collection of artifacts to go out for his lunch break. The 53-year-old walked across the street to a park where as a teenager in the 1970s, he said, he would hang out with his friends. The concrete benches where they’d gaze out on the shore of the Aral Sea are still there, but these days there is no sea to be seen. Instead, children frolic on a rusted merry-go-round. The feeling of nostalgia and loss was palpable. He then invited me to lunch at his wooden shack across the street from the aging Hotel Aral. To my surprise, the museum curator opened the door to a storage room, sat down and started to play a rickety old piano. Not one of its 88 keys was in tune. Then he took out a rusty German trumpet lacking a mouthpiece and pretended to play. It’s easy to understand why Zhasekenov misses the old days. In 1976, according to a historical marker at the once-thriving port, Aral shipped 5,000 metric tons of wool, 340 furs, 3,000 sheepskins, 1,500 pairs of woolen gloves and 1,200 pairs of woolen trousers. Now, the tourists who stop by here can climb aboard the Lev Berg, a fishing boat painted bright blue, and look out over the desertified lakebed. Two rusting cranes that have not been used since the early 1980s hulk above the otherwise flat horizon. 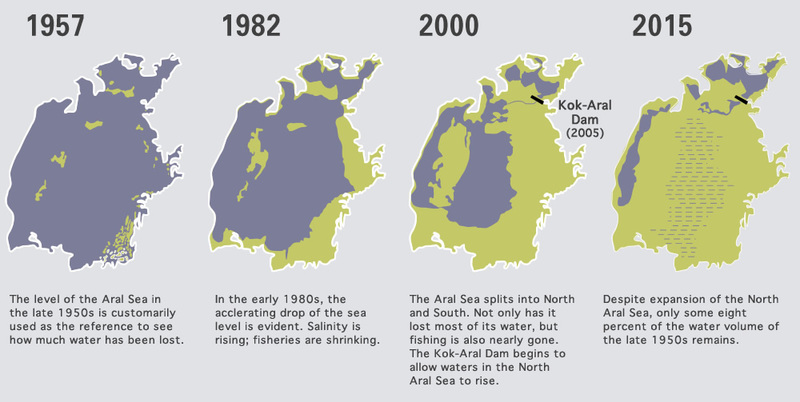 But the waters that by the early 2000s had retreated 100 kilometers from Aral are now only 20 kilometers away, and they are coming closer. “We inherited the problem of the Aral Sea from the Soviet Union, but as soon as we became independent, we adopted special programs,” said Zhanbolat Ussenov, director of the Eurasian Council on Foreign Affairs and former spokesman at Kazakhstan’s Foreign Ministry. The dream of saving the entire Aral Sea—both North and South—is unrealistic, said experts who know the region. But everyone seemed to agree that the first phase of the project Ussenov alluded to—officially known as the Syr Darya Control and Northern Aral Sea Project, or synas-1—has been a success so far. Ahmed Shawky M. Abdel-Ghany, a senior water-resources specialist with the European and Central Asian region of the World Bank’s Water Global Practice, has managed the project from his Washington office since late 2010. He said synas-1 cost $83 million, and it included a subproject for restoration of the North Aral Sea. “We’re not talking about the whole Aral Sea, just the northern part that fully lies in Kazakhstan,” said the Egyptian civil engineer, who’s worked in 20 countries during his 12-year career with the World Bank. He said that one crucial element of synas-1, construction in 2005 of the 13-kilometer-long Kok-Aral Dam, increased the volume of water in the North Aral Sea by around 50 percent in three years. Proof of success so far, he said, lies not only in the decreasing distance from the town of Aral to the shore, but also in the area’s fisheries, which have doubled or tripled output in recent years. 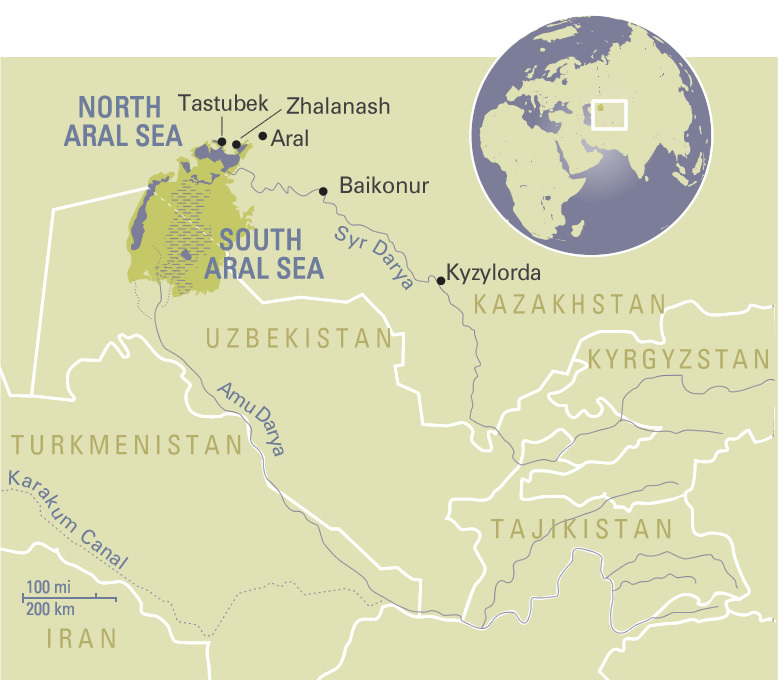 “The government and donors hope that with the synas-1 follow-up phases, the northern Aral Sea gets closer,” he said. But even 20 kilometers seems like an eternity when the only way to cover it is via four-wheel-drive over a dirt road that vanishes into nowhere just past the edge of town. That simple journey required nearly two hours, taking us past the dried-up village of Mergensai as well as scattered, hulking ruins of fishing trawlers that sat abandoned in the scorching sun, covered with graffiti. 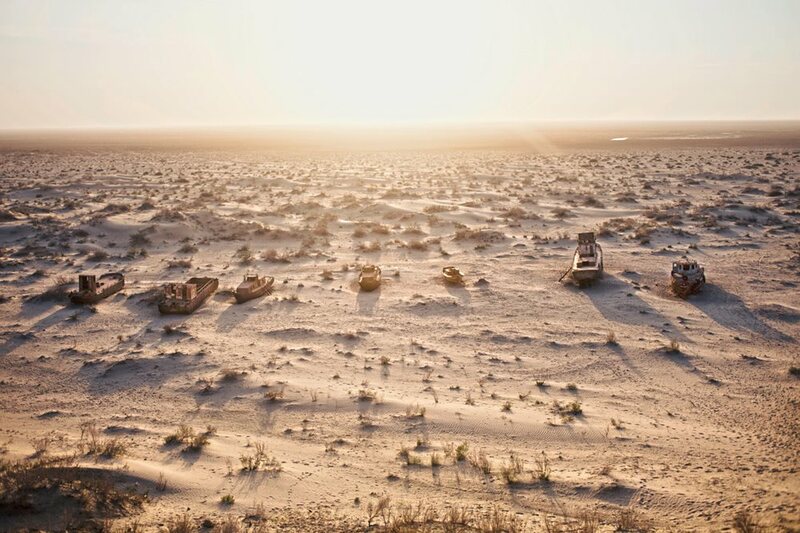 At one time this ship graveyard was a major attraction luring so-called “dark tourism”: Photos of camels roaming the desert with these vessels in the background are on display in the Aral museum, and they have appeared in travel magazines to publicize the plight of the Aral Sea. The camels are still there, though in recent years most of the vessels have been cut up into scrap that has been sold to China. While visitors who actually make it to the seashore aren’t likely to find a hubbub of fishing activity, there’s certainly more going on here than in the recent past. One hardy soul is Marat Karebayev, who sets out on his wooden blue dinghy around seven every morning and usually doesn’t return until five p.m. He’s been fishing for five years, and he said he earns 10,000 to 20,000 tenge (about $55 to $110) each day. From that, he has to deduct the cost of gasoline (about 800 tenge for 10 liters) as well as the fishing net (60,000 tenge), which must be replaced once a year. Some 22 varieties of fish are now commercially exploited from the North Aral Sea, and the catch is coming in around 6,000 metric tons per year, said deputy mayor Darmenov. He added that could rise to 30,000 tons annually if World Bank-funded projects now in place bear fruit. His optimism is shared by Adilbek Aymbetov, director of the Aral fish-processing facility on the edge of town. The plant has been operating for nearly five years. About 25 people work there, packing carp, northern pike and other fish for both local consumption and export to the 28-member European Union. “In 2000 there was huge unemployment, but things have gotten better,” said Aymbetov. In 2013, he said, he processed 300 tons of fish and exported about 100 tons, up from production of 215 tons and exports of 97 tons the year before. million effort is funded by $107 million from the World Bank itself, with Kazakhstan putting up the rest. “The government is really eager to start as soon as possible,” Abdel-Ghany said, noting that synas-2 includes rehabilitating delta lakes, developing fish hatcheries, upgrading flood dikes and straightening river meanderings to improve water flow. Sagit Ibatullin, former chairman of the executive committee of the International Fund for Saving the Aral Sea (ifas), recently told Kazakh media that the five-nation organization’s plan for bringing back the entire Aral Sea—both South and North—if fully implemented, would cost as much as $12 billion. The Kazakh official, appointed by President Nazarbayev, headed ifas from October 2008 to August 2013. The fisheries, engineers and bankers got a boost last year from an unexpected corner: British rock band Pink Floyd, which since its birth in 1965 has decried alienation, commercialism and environmental degradation. Its 2014 music video “Louder Than Words” featured inhabitants of Aral and nearby villages filmed against a backdrop of deserts and abandoned ships. At last count it had been viewed nearly 7 million times. Nobody knows how many fans Pink Floyd has in Aral. But kimep University’s White did say that during his most recent visit to the region, he and his environmental team saw new houses being built; inside homes, he saw new televisions and refrigerators. Aral native Yerken Nazarov, 31, appears to share that newly positive outlook. His grandmother was a fishmonger who lived to celebrate her 100th birthday. Larry Luxner is news editor of The Washington Diplomat and a longtime contributor to AramcoWorld and other publications. 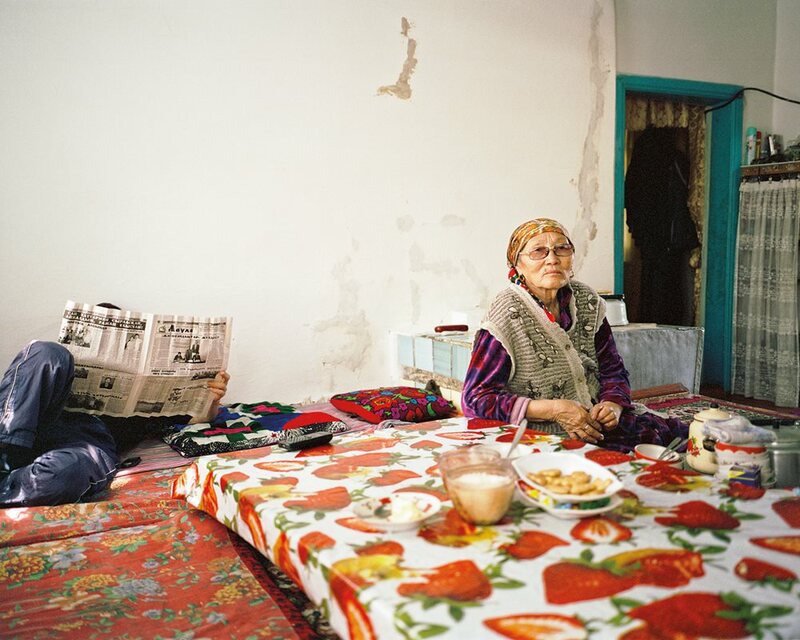 Based out of Istanbul, photographer Carolyn Drake worked extensively in Central Asia between 2007 and 2013. She now resides in the United States, where she has begun a new photo project.